Wolfe not only observed culture, specifically New York culture, he was a part of it. He was known for wearing only white tailored suits, colourful ties and a walking stick with a wolf’s head. There is no denying the great body of work that Wolfe leaves behind and the influence it will have on generations to come. But I’m not really going to write a long and gushing tribute to Wolfe. Don’t get me wrong. I am a fan of his journalism, and his contribution to the style of New Journalism which I have been highly influenced by. I’m also a fan of his fiction, most of which has helped me engage with ideas about race, status and ambition, and how those can be represented in literature. The way he uses dialogue is of particular interest to me. But no, this isn’t a love letter to an icon. After news broke out of his passing, Twitter was filled with tributes. From those tributes, a debate ensued, fueled by what I would say are ignorant narrow-minded claims that with Wolfe’s passing, there are no “great” American writers left. Since then, the other great, Philip Roth has passed away at the age of 85, and this is likely to further fuel a nonsensical argument. As I continue, I would like to point out that I have never read anything by Roth and can’t comment on his work other than by acknowledging that he was viewed as one of America’s greatest novelist. Through his work he explored themes around his identity as a Jew, a writer, a man and an American. If you’re wondering why I might never have read Roth’s work (yes, I know this might seem sacrilegious to some, but just so you know, I also never finished Catcher in the Rye by J.D Salinger, and don’t plan to) then the reasons will be clear to you as I detail the subject of “greatness”. Even before a man, who is currently the leader of the free world, made “great” a part of his campaign slogan, American culture has had a long history, an obsession, with greatness. The greatest country ever, the greatest sports team, the greatest movie you’ll ever see, the greatest story ever told, the greatest voice the world has ever known, the greatest food you’ll ever eat, New York — the greatest city in the world! Being great is part of the myth of the American dream — a dream many people now understand is unattainable unless you have a convincing social media account. Being great and greatness itself have become a part of American culture and the lexicon in such a way that it seems only Americans have the exclusive rights to all things great. Greatness isn’t a flat landscape. There cannot be only one great person in each sector at a time, with constant debates about who will be next to replace the current great. For example, now that Kanye West is suffering from what in Arabic is known as ‘the disease of greatness’, he is more unpopular than ever. The debate about whether he or Jay Z are the greatest living rappers is off the table after Kendrick Lamar won a Pulitzer Prize, and Childish Gambino’s new video This is America went viral. The conversation starts off with the work itself but often, and mostly in America, the debate becomes about comparisons and titles. Great titles. It’s hard to define what greatness actually is in American terms, but in the case of literature, something worth pointing out, is that greatness, or the perception of it, is often male and white. 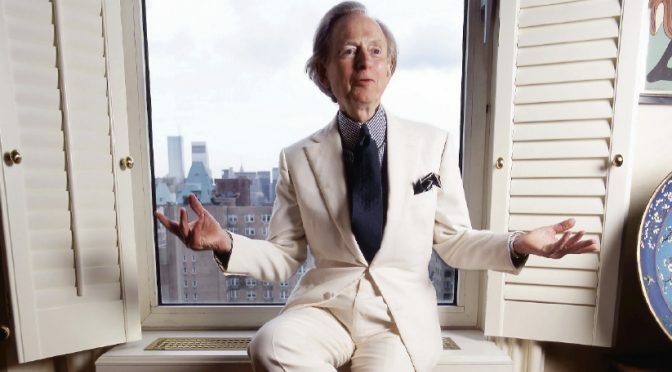 Tom Wolfe is known for two masterpieces. The Right Stuff (1979) a non-fiction book Wolfe wrote when he was interested to learn about the motivation behind astronauts who risked their lives to travel into space. In the book, Wolfe documented the stories of the first Project Mercury astronauts selected for the NASA space program by who interviewing test pilots, astronauts and their families. Wolfe’s second masterpiece is his novel The Bonfire of the Vanities (1987). The satirical novel is a drama set in 1980s, New York and delves into issues around race, social class and politics in the lives of three characters. I have read one of those. I never read the other and not sure if I will any time soon. Having been since childhood a prolific reader, I came to an unnerving moment in my mid-twenties. Looking back at the great authors and writers I have been exposed to, the greatest ones — as dictated to me by the West and particularly American culture— I realised that more than 90 percent of those great writers were European, American — white men writing about their experience. I can’t deny that some of those writers influenced me greatly. But I realised also that as my reading appetite matured, I was developing an innate disconnection from their work. Mainly because I was being told that by looking at the libraries, the book shops in my neighbourhoods, that the only writers worth publishing in abundance are white. I found that also, somehow the small pool writers of colour who have written and do write great novels are often left out of the conversation. Since I came to this realisation, I have made a conscious effort to read more writers of colour. And so, scrolling down the tweets and retweets of this stupid debate — about who shall take forward this metaphorical torch of greatness, like the sash and tiara of beauty queen being passed down — about who is now the greatest American writer of the novel, I thought about Toni Morrison, Alice Walker and Colson Whitehead — all of them great, all of them relevant, all of them not dead. There are many more, I’m sure. I probably just don’t know them as well as I should. Having spent the last few years reading novels by writers of colour and focusing on Arab writers I know that the perception of great is incredible skewed and that the opportunities for writers of colour to be noticed, heard and distributed fairly has been greatly unfair to them. Even today. While reading the tributes written for Wolfe, I think of all the writers of colour from his generation and even before him, who wrote, who could write, who wanted to write who had written great stories but that no one had the opportunity to read.